C-47s as Bombers, P-51 Mustangs vs Corsairs, The Very Last All Piston Prop Aerial War! An oddly looking camouflage applied on a Cavalier Mustang II, that was purchased in USA and converted to full flared Fighter by the Salvadoran Air Force in 1969 in the run up to their 100 hours lasting mini war. Later this war veteran was resold to USA and appeared again in the national Air Show circuit. Mustangs and Corsairs engaged in deadly aerial dogfights, while Dakota C-47’s flew as bombers! A Spielberg Film scene ? No, reality, but when was that? 1945? 1953? 1956? Forget it, that final All Piston Prop Aerial War took place 24 years after WW II ended! Believe it or not, this was a bitter reality in 1969 as the 4-Days War broke out between Honduras and El Salvador, in which only vintage piston powered aircraft were involved that shot each other out of the air. The Honduran Corsairs F-4U’s were the winners. Major Soto, Corsair nr. 609 is now a National Monument in their Aviation Museum at Toncontin AFB. During my visit to this Museum, I came also to see the C-47’s that they had still operational in numbers, but entry to these planes was strictly forbidden, as if we came to spy for El Salvador a Hi Tech aircraft. Paranoia or not, the relations between the neighboring nations are still “awkward”, to say the least. Imagine, the rest of the World had only attention for the Hi-Tech Supersonic Fighter Jets as Phantoms and Mig-21’s from USA and USSR that fought over Vietnam and the Sinai Desert. And while the NASA was just about to land the first man on the moon on July 20, 1969, there was a little war going on in Central America that was totally ignored by the World’s Mass Media as no one wanted to miss a glimpse of the historic first step on the moon, about to be made by Neil Armstrong. After years of tension and skirmishes between the neighboring states Honduras and El Salvador over illegal border crossing and settling of Salvadoran peasants in the larger and sparsely populated Honduras, their disputes came to a sudden climax as both National Soccer teams were running in the same pool for the World Cup 1970 preliminaries. After 3 matches, El Salvador won that selection, but riots broke out in Honduras in which Salvadoran immigrants were molested and expelled or simply fled back home, leaving all their properties behind. EL Salvador’s President Generalissimo Arelllano considered this an aggressive act and took as a retaliation the unwise decision to invade Honduras with his Army and to make with his Air Force a surprise aerial attack on Toncontin Air Force base, located next to the Honduran Capital Tegucigalpa. FAH Corsair F-4U nr 609 piloted by Major Soto, the Ace of the 100 hours war. He also attacked in the Close Air Support the Salvadorian Troops that had penetrated on Honduras’ territory and were driven further back as the FAS was more or less wiped out with the loss of its best pilots and fighters. Note the 3 silhouettes under the cockpit for the kills. Theoretically, this planned assault could have meant a very serious, even fatal blow to the Honduras Air Force (FAH). There was no prior war declaration, the element of surprise was 100% and half of the Enemy’s total Air Force was parked out there without any protection! But as often with such unreal opportunities in sight, Murphy’s Law was applicable without prior notice and all what could go wrong went wrong, to the point of an almost hilarious act if this would have taken place in a film. But this was a real world of war mongers: both nations had since a year an US embargo on arms export, due to their outspoken offensive plans and hostile relations. Hence, both their Air Forces where not exactly equipped with the latest fads as Jet Fighters, Radar or early warning air space defense systems. Instead, they both flew with vintage WWII piston prop fighters and with a lack of bombers, they had converted their Dakota C-47 transports to makeshift Bombers, be it with a limited payload and accuracy. In 1967, El Salvador (and Indonesia) received from USA the Cavalier built Mustang II with structural improvements. The wing was strengthened to carry a total of 4,000 lbs of ordnance and additionally large wingtip tanks and weapon hard points were installed, along with a new Merlin V-1650-724 aero engine. These in Florida newly built Cavalier Mustangs also received a taller tail and in many of them a second seat for the observer/ passenger was mounted. Immaculate US Air Show Mustangs as this Cavalier built Mustang II were snatched for big money and illegally exported via the Banana Route to El Salvador. Under wing weapon hard points and 6 machine guns were installed, while the wing tip tanks were often removed for better maneuverability in the dog fights against the Honduran Corsairs F-4 U’s. Both Air Forces were in dire need for more aircraft during the build up of their evil intentions and tried to circumvent the US embargo with most inventive ways to find the loopholes. The more aggressive FAS (the Salvadoran AF) managed to buy in the USA 7 P-51’s from private owners who flew those Cavalier Mustangs in the American Air Show circuit! These aircraft were the “demilitarized” versions (Cavalier F-51D) and needed some conversion to become a “hot hatch”. These non armed but fast aircraft went via Haiti and a handful of Banana Republics to El Salvador for a speedy conversion to a deadly fighter. Guns, sights and hard points were remounted for the imminent showdown with their opponents from FAH , who flew with 10-12 obsolete but potent Vought Corsairs F-4U’s. 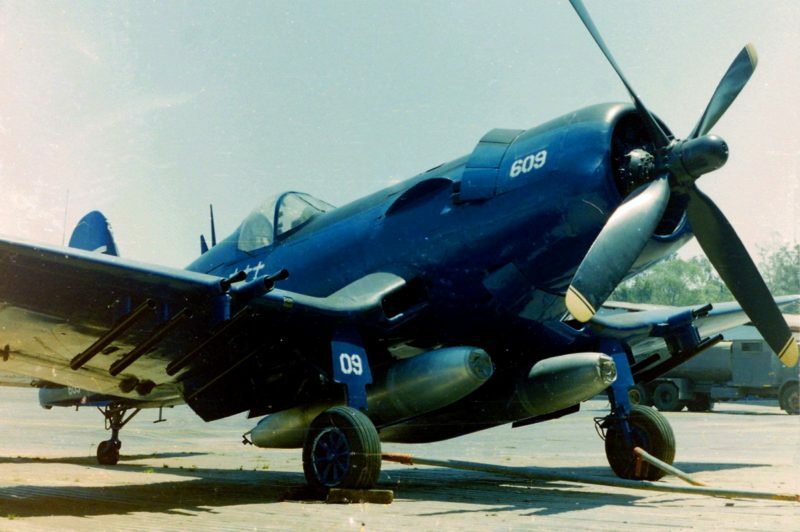 FAS had also 10- 12 Corsairs operational in the FG-1/ FG-1D Navy version (built by Goodyear), all of them delivered by the USA in earlier years, in order to keep the balance between the nations in numbers and capability in air strike power. Jets were strictly forbidden wet dreams, even the pronouncing of the J-word was an offense. But FAS who had more fighters from the outset with their Mustang II’s and tried to further outnumber FAH with the stealthy purchase of the US based Cavalier Mustangs, in an attempt to double their P-51 fleet. On 14 July 1969 by end of the day, the aerial war started with a surprise attack on Honduras main Air Force base Toncontin. Two Dakota/C-47’s and two P-51’s as fighter escorts were taking off from the Salvadoran Ilopongo AFB for a combined assault, but for a variety of reasons, all aircraft missed their rendezvous and finally only one single C-47 completed its flight over enemy territory to Tegucigalpa and flew over the unprotected airfield with the rows of Corsairs, C-47’s, T-6’s Texans and T-28’s Trojans parked right below them. Not to be missed but …. well, just keep reading.